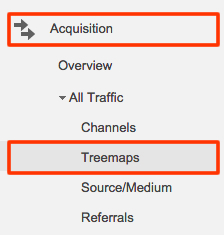 Google Analytics have brought out the new Treemaps report in the Acquisition section. This new report brings quick, visual insights to all channels and allows you to see a graphical representation of all your incoming traffic and instantly compare the performance of different channels. Treemapping means displaying data by using nested rectangles. With treemaps you can visualise trends and detect problems amongst your channels quicker than by looking at numbers alone. 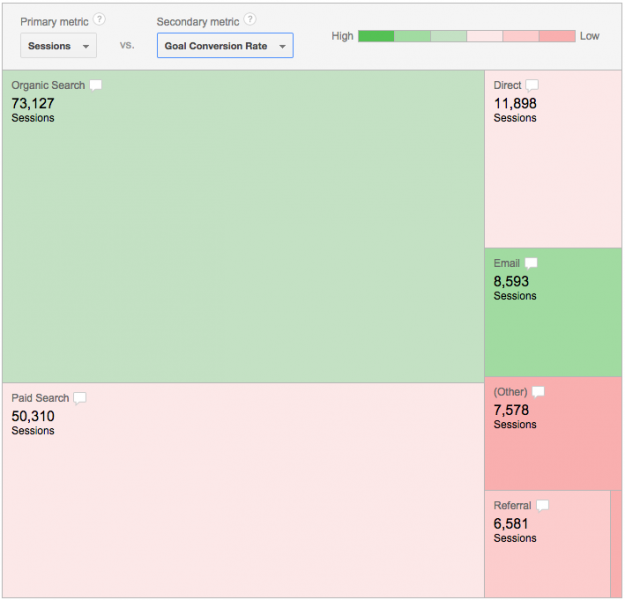 Following an introduction of treemaps into Google AdWords last October, treemaps have now been added to the Acquisition section of Google Analytics. Try viewing a few metrics in this report, and you will understand the different channels like never before. Primary metrics are volume metrics, and are represented by rectangle size. Here are a few examples of reports you can quickly run to understand the performance of your channels. 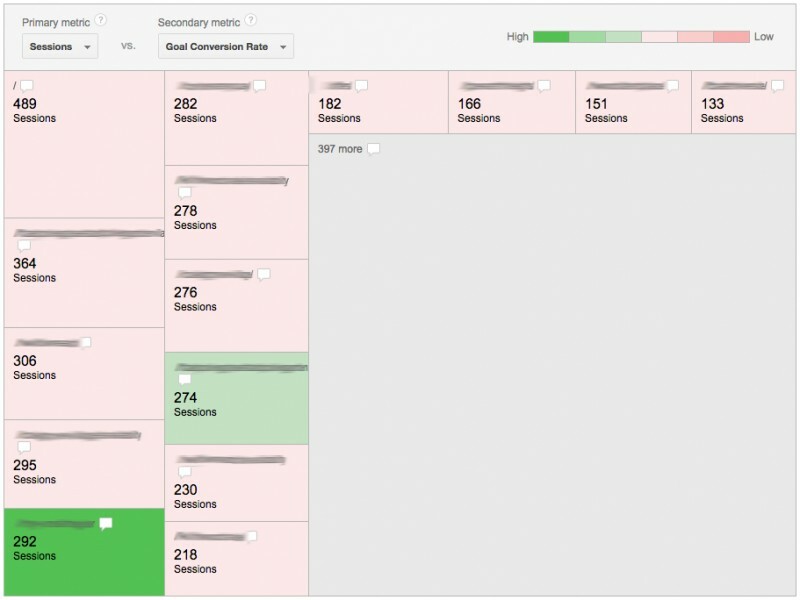 Set your primary metric to Sessions and your secondary metric to Goal Conversion Rate and you can immediately see which channels deliver higher goal conversion rate, these are presented as green boxes. ‘Organic Search’ and ‘Email’ in my example are the best converting channels. Looking at this information we need to find a way to increase volume from both of these high converting channels. Clicking on the ‘Email’ channel in the chart we can see that not every email campaign brings a high goal conversion rate. One of the email campaigns on the chart is definitely worth focusing on – the campaign with the highest number of sessions (visits) to the landing page suffers from considerably lower than average goal conversion rate (-93.87% compared to site average). Another email campaign which has the highest goal conversion rate is also worth looking into. What can we learn from it to apply to all other email campaigns in our account? Studying both of these campaigns will help identify what landing pages, email creative, and content help to increase performance. Analysing channel performance is not always straight forward. 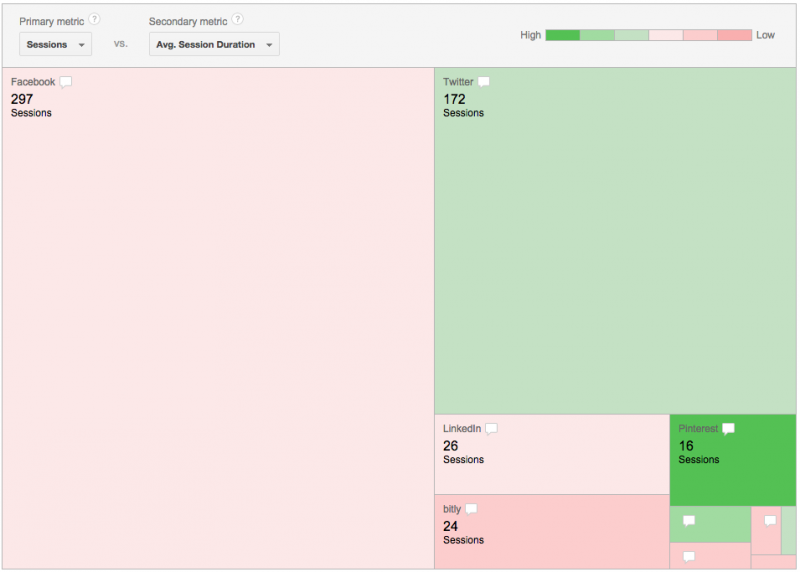 Looking at session duration from each channel can reveal where you get your most interested visitors. You will immediately see that sessions from ‘Organic Search’, ‘Social’ and ‘Direct’ channels bring visitors with the sessions duration well above site average. If you business goal is to keep visitors on the website for as long as possible (if you run a News website or a Blog for example) you should pay attention to this report. Click on the ‘Social’ channel to learn about each social network. 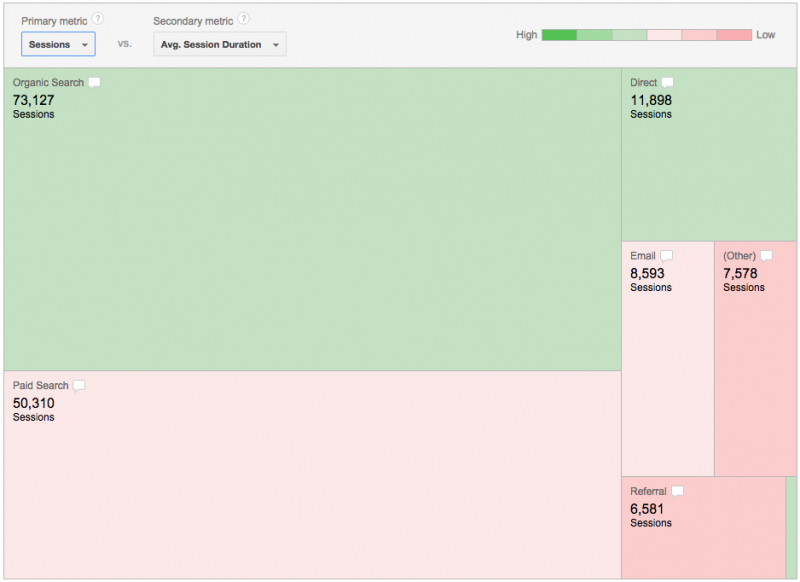 In my example below the average session duration from Pinterest is 294.88% higher than site average. Twitter is another source of visits with longer sessions, whilst LinkedIn and Facebook refer the shortest visits. In addition to charts, you can use the table below to see more specific details for all channels. The table contains the numbers that correspond to the rectangles’ size and colour. Click on ‘Comparison’ icon in the top right corner of the table to show details for all channels in comparison with the site average. You can quickly see which social networks bring visitors who stay on the website longer. In order to understand which channels drive new users, and which of those are doing a good job of making those users want to know more and read past the first page set your primary metric to ‘New Users’ and secondary metric to ‘Bounce Rate’. This chart is an example of when the color scale is reversed for the secondary metrics – the Bounce Rate. For Bounce Rate, lower numbers are better. 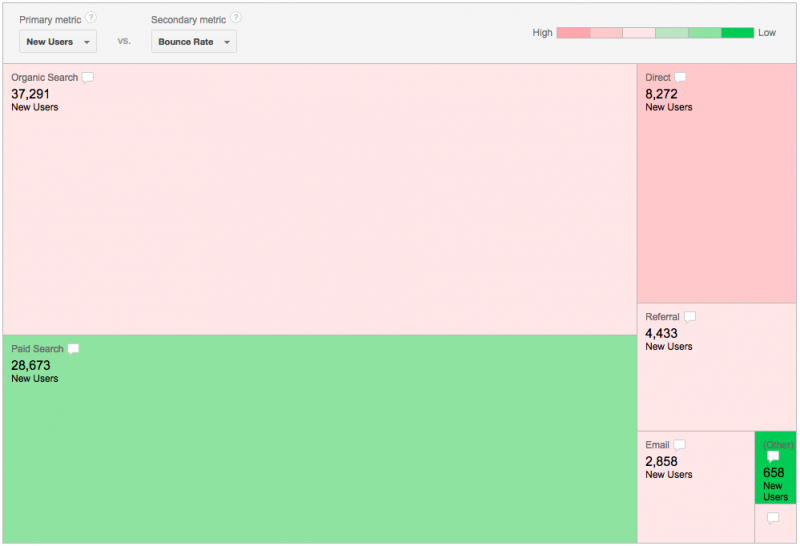 The rectangles are red when you have high rates of the Bounce Rate, and are green when the rates are low. Things are looking pretty good for the ‘Paid Search’ and ‘Other’ channels. It means that your paid search campaigns are doing a great job of bringing new users who find your content relevant. Clicking on ‘Other’ channels on the chart will show more details about which particular mediums contribute towards the success of this channel. These three reports are just to give you a flavour of what is possible and you should try running other combinations to find the insights you need. Treemaps will help you save time looking at numeric data in your Google Analytics account and visualise it for you. Polly Pospelova is a passionate online marketing professional who thrives on delivering unique value-driven search solutions. As well as managing Delete agency’s natural and paid search teams, Polly works closely with both technical developers and UX specialists to maximise customer experience, customer engagement and conversions.